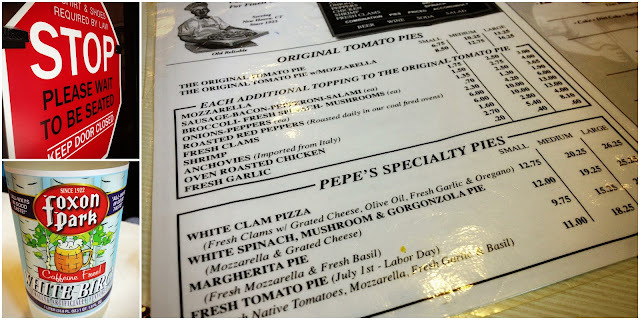 The first time I heard about Pepe's Pizza was long before I moved to Connecticut. It was about two years ago to be exact. That's when I became friends with Ben. In one of our early conversations, I asked him what his last meal on earth would be, and without hesitation, he practically yelled "Pepe's Pizza," which he remembers fondly from spending summers in Connecticut. He also recalled stories from college when, after a few drinks, he would call Pepe's and try to talk them into overnighting a pizza to him in Arizona. I was intrigued. But also skeptical. Fast forward to a few months ago when I decided I was taking the job at ESPN. Ben and I were having lunch as part of the #SireSF goodbye tour, and he made me promise to wait to experience Pepe's until he could be there to walk me though it. Fortunately, I only had to wait two months after my arrival in CT, and as a bonus, our friend Matthew was also in town to sample one of the oldest pizzerias in the country. 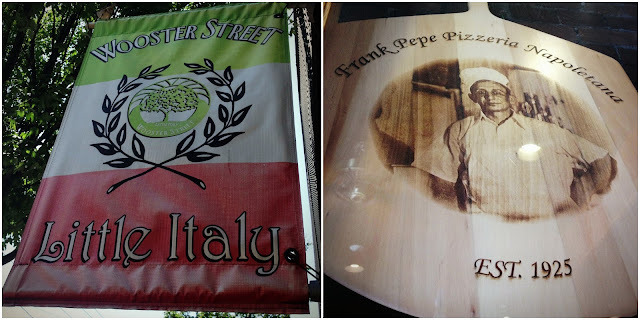 Pepe's first opened its doors on Wooster Street in New Haven in 1925. This is the same street you'll find the long-standing rival to Pepe's... Sally's, which was opened in 1938 by Frank Pepe's nephew. There are two very divided camps on which place serves a better pie. Some are staunch Sally supporters, others are Pepe's purists 'til they die. (Ben falls into the latter camp obviously). 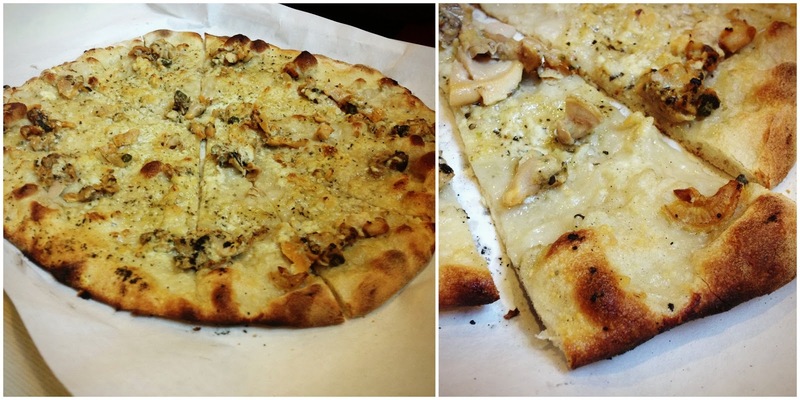 Both serve the same thin-crust style pizza you'll find in Southern Italy. Ben also recounted a story about the water on Wooster street being the best in New Haven, which is why the city's best pizzerias and bakeries reside here. I couldn't find anything to support this theory, but it sounded cool nonetheless. At the center of the restaurant, is a big open kitchen where you can see everyone hard at work making "apizza" (pronounced "ah-BEETS" in the Neapolitan dialect). Pepe's uses coal ovens, made of brick and based on the original from 1925... even using the same dimensions from those early days (hey, if it ain't broke....). Whichever pizza establishment you choose, you will likely wait in line. We arrived right around lunchtime on a Sunday and surprisingly didn't have to wait too long until we were seated and drooling over the menu. All Pepe's locations feature the same options, including Foxon Park sodas from East Haven...which they have served since 1925. (White Birch Beer FTW). First of all... I sort of love that the pizzas aren't perfectly round. They are more oblongish, and they are cut in only a way one can cut a football-shaped pizza. But what I love even more is the way the crust gets a little black in spots from the hot coals. I also happen to adore the same effect that intense heat has on the cheese... bubbling up, with brown freckles blanketing the entire pie. Before Matthew and I took our first Pepe's bite, Ben spoke these wise words to us: "If you don't think this is the best pizza you've ever had, you can go f*ck yourselves." Well, then. No pressure, Ben. If sca-MOTZ was the opening act, the White Clam was the main event. I can honestly say I've never tasted a pizza quite like this one. There's no sauce... just crust, chopped garlic, olive oil, oregano, grated cheese and fresh littleneck clams. Pepe's first started offering fresh clams on the half shell at the bar, and then in a stroke of genius, decided to put them on a pizza. Pepe's refuses to use canned clams, and three men are employed by the restaurant strictly to shuck clams everyday. Somehow, learning this story made this pizza taste even better. After you've finished stuffing your face with pizza and positive you can't fit another drop of food in your stomach, pop next door and get a little "squeeze cup" of Italian ice at Libby's Italian Pastry shop. You won't regret it. My first Pepe's experience was definitely a memorable one, though Ben's excitement definitely added to the experience. I am interested to try Sally's just for comparison's sake, or perhaps Modern (originally State Street Pizza, established in 1934) or the newer "Bar." However, Pepe's set the standard pretty high, and I'm ecstatic about them opening a location in West Hartford this summer. In the meantime, thanks to Ben, for sharing his little "slice" of New Haven pizza heaven. LOVE it! Looks like we can both agree on that delish white clam pizza! Jaymee; haven't made it down to Pepe's yet (only been in CT 3 years now; gotta go soon). Luna on Farmington Ave. is a good choice in WH, and my neighbor owns Lena's Pizzeria/Sully's Pub on Park right at the WH/Hartford City Line, which does a very nice thin crust too. 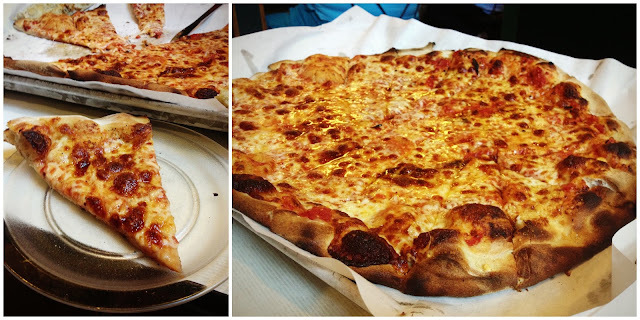 Have you tried either, or Harry's, or Joey's Pizza Pie? I haven't yet...but did you hear WH is getting a Pepe's this summer?! So excited! Love it Jaymee, white clam from pepe's is now on my bucket list. BTW I'm from the Bay Area so it might be awhile. Glad you finally went to Pepe's. I am in total agreement there is nothing like a Pepe's Clam Pizza. Totally unique, totally incredible, and totally satisfying. There is only one Clam Pizza and you can find it at Pepe's. Some would argue (hey don't look at me...), that you have not had a Pizza until you've gone to the other end of Wooster Street, and checked out, Sally's Apizza. Salvatore Consiglio (Frank's nephew) created his own special brand of apizza. And as you may know there is a fierce rivalry between Sally's Fan's and Pepe's Fans. The debate continues as to has the best pizza. But as you know, you'll just have to check it out for yourself! There is a lot of great pizza in New Haven, you'll want to check out, Modern, Bar and Zuppardi's to name a few.... I wish you the best in all of your pizza adventures. And thanks for spreading the joys of pizza!